This post has been read 384 times! Update August 23, 2018- Likely as a result of this article and numerous BPTV communications to the Ohio State University, Gene Smith received a slap on the wrist two-week suspension. However, the bigger punishment has been that his name is now attached to this scandal as one of the wrongdoers. He had to sit at the Table of Shame during the press conference. The national media response has been harsh, essentially accusing the university of double-talk and lying. It got even uglier when CBS News mistakenly called Gene Smith the “ex-husband of accuser Courtney Smith” instead of coach Zach Smith. Yikes! 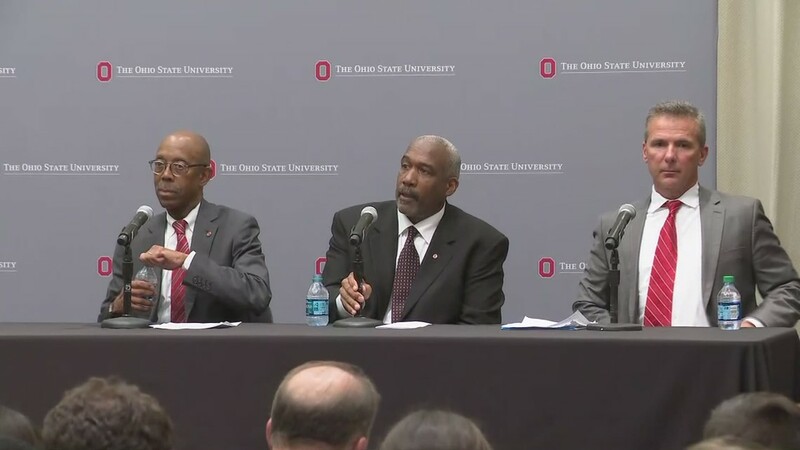 The next scandal to come out of OSU athletics (and there will be one), should be Smith’s last straw. It is another year and time for another major scandal from The Ohio State University Athletic Department. This time, the successful football coach, Urban Meyer, has been placed on paid leave as the university hires outside council to create a whitewash report about the handling of an assistant coach who allegedly beat his wife. Another scandal brewing is an alleged conspiracy by the university to cover up decades of complaints by athletes about a team doctor, Richard Strauss. He allegedly fondled players, ala the Michigan State scandal. Back in 2011, coach Jim Tressel was fired for supposedly not reporting to the NCAA and investigators what he knew about players who were selling their own sports memorabilia. Apparently, the NCAA bans players from selling their own hard-earned property. For the last several years, the Ohio State basketball program had suffered under the leadership of coach Thad Matta. It was clear to anyone that Mr. Matta was under the influence of pain pills, often sitting on the sidelines dazed in a high. The Athletic Director overseeing all of these scandals has been Gene Smith, who earns a salary in excess of $2 Million. However, in almost none of the bad press has his name ever been implicated. The coach at the center of the current football scandal, Zach Smith, recently spoke to the press and claims that Gene Smith knew about 2015 allegations that he abused his wife. When will the university board, president, and media start to point the blame at the head of the Athletic Program? By the way, how is it acceptable for a state employee administrator, such as Gene Smith, to earn more than $2 Million in salary? Is the money derived from Big Sneaker Industry graft that the FBI is investigating currently? This entry was posted in -- In the News, Op-Ed, Sports and fitness, Sports Essays. Bookmark the permalink.